The Duangtawan Hotel was the setting for last months Skål reunion and it certainly gave members and guests a fantastic overview of Chiang Mai city. At a dizzying height on the hotel’s 24th Floor, a multi-coursed Chinese banquet was served with grace and style. Pre-dinner wines and drinks were passed around and, as dusk fell, it was amazing to see our northern city begin to shimmer with lights and glitter. Ampaipun Tabtong of Maetaman Elephant Camp receives her Skal member’s certificate from her daughter and Skål President Anchalee Kalmapijit while Marc Dumur looks on. Skål President, Khun Anchalee Kalmapijit, warmly welcomed members and guests to this the fourth dinner meeting of the year. Before dinner got under way, Past President Margaret Bhadungzong spoke about the public meetings being held at the Buddhasatan to alert Chiang Mai citizens to the disastrous consequences of smoke pollution on visitor numbers to our ancient city. Member and eco-tourism expert, Shane Beary, has already presented a white-paper to the Royal Thai Government with suggestions as to how both public and private sectors can co-operate in solving environmental difficulties. During the serving of first courses, Reinhard Hohler presented a fascinating audio-visual DVD entitled “The Jewel of Suvannaphoum” (the Golden Land - rather than anything to do with the new Bangkok Airport). It traced part of the long and remarkable history of the Emerald Buddha (now at Wat Phra Kaew in Bangkok) and, uniquely, showed footage of His Majesty King Bhumipol changing the robes of this revered Buddha image. 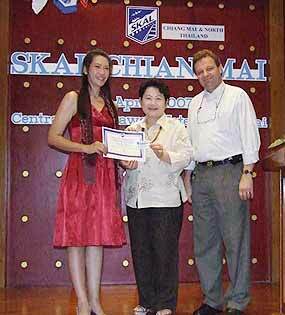 Khun Ampaipun Tabtong of Maetaman Elephant Camp was presented with her Skål Member’s Certificate. 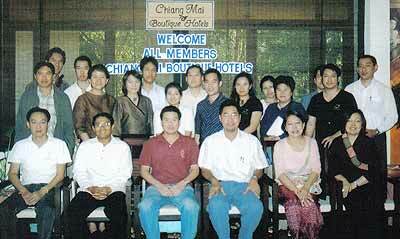 Chiang Mai’s boutique hotel owners and managers meet to implement effective marketing strategies. A view of the pool at the Hard Rock Hotel in Pattaya. Riding high on a wave of successfully held big international events, the resort city of Pattaya has truly come of age. In 2006 alone, Pattaya’s long list of international events include the 67th Skål International World Congress - the world’s largest gathering of tourism and hospitality professionals, as well as the annual Incentive Travel & Conventions, Meetings Asia (IT&CMA) and the Asia Pacific Advertising Festival (AdFest) which were both consecutively held here for two years. While Pattaya has become a destination of choice for Meetings, Incentives, Conventions and Exhibitions (MICE) planners, Pattaya continues to be a favorite among individual and family holidaymakers. Over the years Pattaya has not only enjoyed cleaner waters and a greener environment – thanks to ardent re-greening projects spearheaded by government and private organizations – but a burgeoning of family-oriented and value for money attractions as well. From the championship-standard golf courses nearby, the availability of glitzy Las Vegas-style shows, the development of adrenalin-pumping adventure spots like Paintball, Go-Karting and water sports venues to marvels like Underwater World, Ripley’s Believe It Or Not Museum, The Sanctuary of Truth and Nong Nooch Tropical Garden, Pattaya satisfies a wide spectrum of holiday pursuits. While Rock ‘n’ Roll revolutionized music all together, the opening of the musically-themed Hard Rock Hotel Pattaya in 2001 became one of the major catalysts in reshaping the City’s tourism landscape and renewed popularity with the opening of Suvarnabhumi Airport. It brought in a more diversified class of tourists looking for more than common Thai-style hotels. People found a hotel where they can truly be themselves and experience a unique and memorable holiday. Rated as a four-star property by the Hotel Standard of Thailand, the Association of Thai Travel Agents (ATTA) and the Thai Hotels Association (THA), Hard Rock Hotel Pattaya features 320 musical-themed rooms with 2 Club Floors. With a massive guitar structure fronting Pattaya’s Beach Road and boasting the City’s biggest free-form beach sand pool with 11 cabanas open till 10 p.m., the Hotel is regarded as an icon. What sets the Hotel apart is its unique interior - refreshingly minimalist jeweled with Rock ‘n’ Roll memorabilia and unique service style. Described as energized, service here is attentive yet unobtrusive. More like friends serving friends, without compromising professionalism. At the forefront of this dynamic service is the Hard Rock Pattaya’s band of merry Rock Agents (RAs) “patrolling” the property, spreading cheer with funny antics and friendly conversation to please young ones. A recently jazzed-up Kings Club Lounge, an executive club lounge adorned by memorabilia of two music kings; Elvis Presley and BB King, offers VIP check-ins/outs, exclusive breakfast buffets and afternoon cocktails. To many of its Kings Club Floor Stars (guests), this daily evening gathering is more like a cozy party for people of who have come to know each other as friends while enjoying the Hotel’s award-winning canapés, cool beverages and sparkling wine. Apart from the private cocktail and use of a spiffy new executive lounge, guests occupying the 53 suites on Kings Club Floors enjoy secure and private floor access. Due to its uniqueness, Asia’s second Hard Rock Hotel was recognized as the world’s best by Hard Rock International with a “Hotel of the Year” award in 2005. Since Hard Rock Hotel Pattaya’s opening, other global hotel brands have taken notice of Pattaya. In recent years, brands like Mercure and Sheraton have setup shop at this once sleepy town, with talks of more hotel groups to come. Enjoy a holistic hideaway package for two at JW Marriott Phuket Resort & Spa in a Deluxe Sala Garden View room for three nights (26,900 baht US$829), four nights (33,500 baht) or five nights (39,100 baht). The package is inclusive of airport transfers, daily breakfast, one-hour private lessons for yoga, meditation, pilates and yogilates, a 90-minute Thai massage and 10 per cent discount on Mandara spa treatments. Tel: (66-2) 656-7707, email: [email protected] .com, website: www.jwmarriott phuket.com. The Mandarin Oriental Dhara Devi in Chiang Mai’s three wellness packages are based on a minimum of four consecutive nights’ stay for US$850 (single) and US$1,400 (double) in a Colonial Suite. The packages are inclusive of airport transfers, head and body treatments, back and foot therapies and use of the steam and chromo bath and fitness facilities. The offers are valid until October 31. Tel: (66-53) 888-888 ext 8929, website: www.mandarinoriental.com/chiangmai. The Paradee in Koh Samed is offering a three-day/two-night package for two valid until June 30. Guests are allowed a choice of villas, daily breakfast and dinner, afternoon tea and speedboat transfers to the mainland. Prices start from 32,000 baht (US$986). Tel: (66-2) 438-9771/2, email: [email protected], website: www.samedresorts.com.